President Donald Trump makes a brief statement to the media as he leaves after addressing a meeting at U.N. headquarters, Sept. 18, 2017. 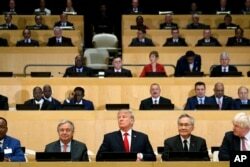 U.S. President Donald Trump, in his first address to the United Nations General Assembly, will harshly criticize North Korea, Iran and Venezuela. "He will speak in extremely tough terms about the North Korean menace and the threat it poses to our security and the security of all the nations in that room," according to a senior White House official who gave reporters a preview of the address. "And he will talk about, as well, the enablement of the North Korea regime." Trump will call on U.N. members Tuesday to confront Pyongyang over its nuclear weapons and intercontinental ballistic missile programs, and block them before North Korea's military becomes more formidable, according to the official. Without citing specifics, the official said the president will speak about Iran and the tension between its government's direction and policies and the desires of its people. President Donald Trump participates in a photo before the beginning of the "Reforming the United Nations: Management, Security, and Development" meeting during the United Nations General Assembly at U.N. headquarters, Sept. 18, 2017. Trump said Monday that the United States will walk away from the Iran nuclear deal it agreed to in 2015, along with five other nations, if Washington deems the U.N.'s International Atomic Energy Agency is not tough enough in monitoring it. The senior official, who refused to be identified, briefed reporters by telephone Monday about Trump's prepared speech, which is expected to be the president's most widely viewed address since his inauguration eight months ago. 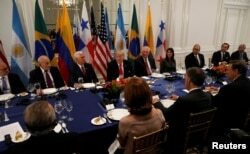 Trump was to speak about political and economic instability in Venezuela just hours after his working dinner Monday night with Latin American presidents. Terrorism will also be a major focus of the speech, the senior administration official said. White House officials said Trump's message to the world's nations gathered in New York for the General Assembly session was intended to be deeply philosophical, building on the president's remarks earlier this year in Poland and Saudi Arabia on the theme of "principled realism." "The president spent an enormous amount of time crafting, developing and fine-tuning his address in every respect," according to the senior White House official. U.S. President Donald Trump, center, attends a working dinner with Latin American leaders in New York, Sept. 18, 2017. The speech contains an "optimistic vision for international cooperation based on respecting individual sovereignty," but "everyone in the world who needs to be delivered a message in the speech will understand what messages are being delivered and in the way and fashion that that message is being delivered," the official told reporters. Trump's address at the United Nations is likely to be his most widely viewed speech since his inauguration eight months ago. Asked what reception the administration hopes Trump's message will receive, the senior official said there is "no question that it is a huge event," and noted it also would be an "enormous opportunity to demonstrate U.S. leadership and U.S. values." As a presidential candidate and after taking office, Trump repeatedly berated the United Nations, calling it a talking shop that is utterly weak and incompetent and "not a friend of democracy." On the eve of his maiden speech to the world body, he toned down his criticism substantially. Flanked by U.N. Ambassador Nikki Haley and Secretary General Antonio Guterres, Trump said the United States encourages "all member states to look at ways to take bold stands at the United Nations, with an eye toward changing business as usual and not being beholden to ways of the past which were not working." The chairman of the Senate's Armed Services Committee, Republican John McCain, told VOA he hoped Trump would speak about "how we have to stand up for the things we believe in, about the fundamental principles of democracy, about what Ronald Reagan used to say [America was] — a shining city on a hill. We have to assume moral leadership as well as the military and other leadership of the world. And we are not adhering to that." The vice chairman of the Senate's Select Committee on Intelligence, Democrat Mark Warner, said he hoped the president "recognizes there is a great deal of responsibility" in presenting "a case in front of of all the assembled leaders of the world." "Part of leadership is bringing appropriate decorum to the office," Warner told VOA. "So the less tweets and the more substance, the better." Republican Senator Roy Blunt, who sits on appropriations subcommittees for defense and diplomacy, said Trump is known for the frankness of his public remarks, so no one should "worry too much about ruffled feathers or what kind of response the president gets. If you are doing the right thing, people will often be critical of you, and I don't think there is anything wrong with that." Michael Bowman on Capitol Hill contributed to this report.